All events are free unless noted otherwise. For additional information, please call (517) 483-1488. The shows listed here are produced by LCC Performing Arts, or with the support of LCC Performing Arts. For information about other shows on LCC's campus that are not listed here, please contact LCC Conference Services at 517-483-9300. Dart Auditorium is located at 500 N. Capitol Avenue. The Black Box Theatre is located in Room 1422 of the Gannon Building at 411 Grand Avenue. Follow these links for a map of LCC's Downtown Campus and Parking Information. The event kicks off LCC's annual Black History Month programming. The concert celebrates the legendary John Coltrane featuring guest artist Rafael Statin, a multi-instrumentalist from Detroit, with the LCC Faculty Jazz Quartet: Dennis Therrian (piano), Jon Gewirtz (saxophone), Ed Fedewa (bass) and Mike Daniels (drums). The hour-long concert will be followed by light refreshments and conversation. Featured selections being performed include: A Love Supreme, Giant Steps, Lonnie's Lament, Dahomey Dance and Wise One. Post-show discussions will take place following Saturday evening performances on February 16 and 23. In January 2018, college producers from around the Midwest saw the University of Wisconsin-Stevens Point production of STUDENT BODY at the Region 3 - Kennedy Center American College Theatre Festival in Indianapolis. One year later, three of those Michigan colleges are now presenting their own productions: Kalamazoo College in late February, Albion College in April, and Lansing Community College Feb. 15-24. What drew these schools to Frank Winters' drama is how loyalties and friendships confuse a seemingly straightforward ethical dilemma. LCC is proud to host Detroit native, Kisma Jordan for a special afternoon recital. Jordan, who has been described by the New York Times as a "shimmering soprano voice," performed last season with the Toledo Symphony Orchestra, the Warren Philharmonic and at the Savannah VOICE Festival. Jordan earned her Bachelor of Music from Kentucky State University and her Master of Music from Bowling Green State University-College of Musical Arts. Among many prestigious awards, Jordan received the 2014 Kresge Artist Fellow by the Kresge Foundation. Join us for this free event in Dart Auditorium! The band will be featuring the music of Herbie Hancock (Maiden Voyage), Horace Silver (The Jody Grind), Count Basie (Hay Burner and Basie Straight Ahead), Oliver Nelson (Yearnin'), and Duke Ellington (Solitude). Col. Mike Daniels' annual drum extravaganza hits the stage in Dart Auditorium. The concert features The Bash Battalion and many other musicians and bands from the area including: Good Cookies Band, Root Doctor Band, Autumn Tribe Ensemble, Doc Yankee and his Boogie Woogie Piano, Ritmo Band, Frog and The Beeftones Band and Tommy Foster. Musical numbers include several original pieces by Mike Daniels as well as other arrangements. Welcome to the hilarious, terrifying and surreal world of child beauty pageants. Pinky Corningfield will do anything to make sure her little angel wins the ultimate title, Supreme Queen. When Marge, a newcomer to the pageant circuit, shows up and starts grabbing all the glory, Pinky and her minions, Bob and Bobby, use some unorthodox methods in order to ensure her darling, Chevrolet, is victorious. Glitz. Glamour. Kidnapping. Money. Really, really small false teeth. April 6 and 7 performances will be sign interpreted by LCC student interpreters. LCC dance faculty and guest choreographers focus on styles from notable choreographers who have influenced them - paying tribute to such greats as Bob Fosse, Martha Graham, George Balanchine and Alvin Ailey, to name a few. The collection of one-acts in Orphan Blues are about successful or failed attempts at connection in a dislocated world. The types of attempted connections are romantic, moral, social or familial, and they often take place in a world in which there is no parental presence. These characters are lonely, and they are reaching out for some type of connection. Included are works by David Ives, Terrence McNally and Beth Henley, among others. A concert featuring LCC's vocal and instrumental ensembles. Fourth semester theatre students' capstone project. Want to take your place on stage? 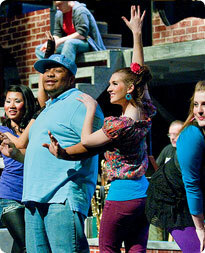 LCC offers associate degrees in theatre, music, and music industry, certificates in musicianship studies and music technology, and dance courses and internships. Courses can also be taken as electives for other degrees or transfer programs, or for personal enrichment. Call 517-483-1546 or visit www.lcc.edu/cma for more information.